Drones are poised to take over the skies, zipping along not just to deliver the doughnuts and hot coffee you just ordered online, but also life-saving medical supplies for both humans and endangered ferrets (not to mention possibly ruining your wedding as well). Drones are indeed changing our world, but in all of these cases, safety is the paramount issue. After all, no one wants a drone to smash or cut them in the face or accidentally drop something on their head while they are waiting for their delivery. 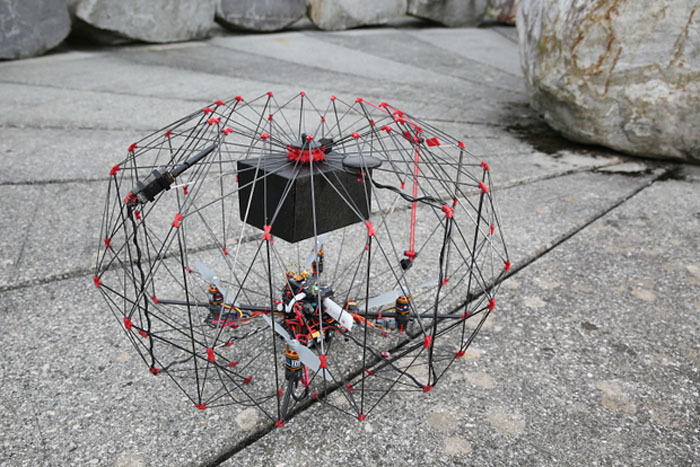 Engineers at the Laboratory of Intelligent Systems at Switzerland’s École Polytechnique Fédérale de Lausanne (EPFL) have a solution: a foldable multicopter drone that forms a protective cage around itself and its cargo when airborne, and which can collapse and fold away into a neat little package when not in flight. Inspired by the folding structures of Japanese origami and Chinese paper lanterns, EPFL’s origami-like cargo drone can be folded down to reduce its volume by 92 percent. 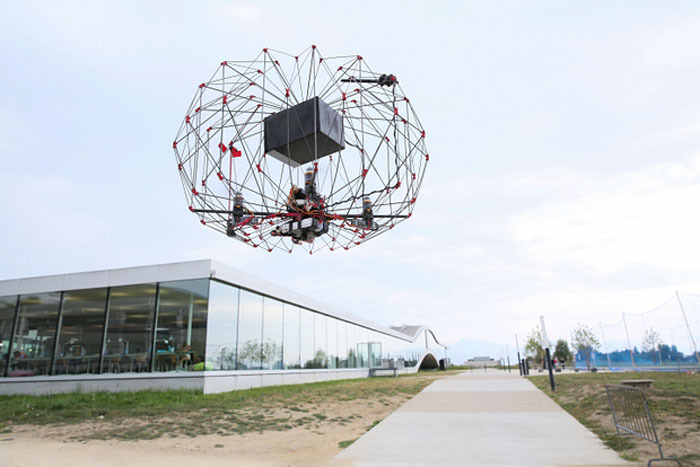 When the drone’s cage is open, its large interior volume helps to generate the lift needed to accommodate packages — which, for this current prototype, maxes out at 500 grams. It doesn’t sound like much, but the idea here is to address safety to the “last centimeter” problem in peer-to-peer and commercial deliveries. According to the team, though there are drones there is no other drone out there quite like this one, which not only increases user safety but also eliminates the need for dedicated landing pads and also tackles the issue of portability. The team turned to origami techniques for clues, as origami structures demonstrate high strength-to-weight ratios and are able to shrink significantly by folding. If you ever look closely at an instructional diagram of how to fold an origami work, you will notice that it’s composed of “tiles,” which are in turn, joined by dotted lines that indicate folds. This design allows optimal airflow for the multicopter’s propellers, in addition to creating a rigid, durable structure that provides more stability during flight, especially with relatively heavier pieces of cargo that may cause the drone to wobble and destabilize while in the air. Thanks to the large number of segments, the modular structure is dense, meaning it’s safer for the receiving user to take hold of it, but the trade-off is that there is increased drag and a smaller allowable payload. The team also found that it is more efficient for the cargo to go above the multicopter, so that airflow from the propellers isn’t blocked, which would reduce their efficiency. 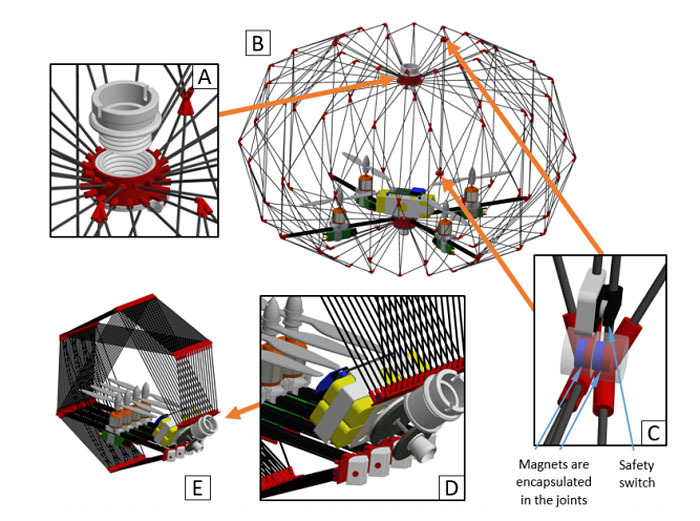 The design also has the arms of the multicopter replacing some of the struts in the cage, so that the structure is an integrated whole, reducing weight and simplifying the opening and closing of the device. As an extra protection feature, the cage has a safety locking mechanism that stops the propellers once it is in the open position. The team recently presented the prototype at the International Conference on Intelligent Robots and Systems. The team’s aim is to now work on scaling this origami-like cargo drone up for larger payloads, with the prototype potentially enlarged to have a carrying capacity of 2 kilograms over 15 kilometers, which they estimate would constitute 86 percent of all Amazon deliveries. 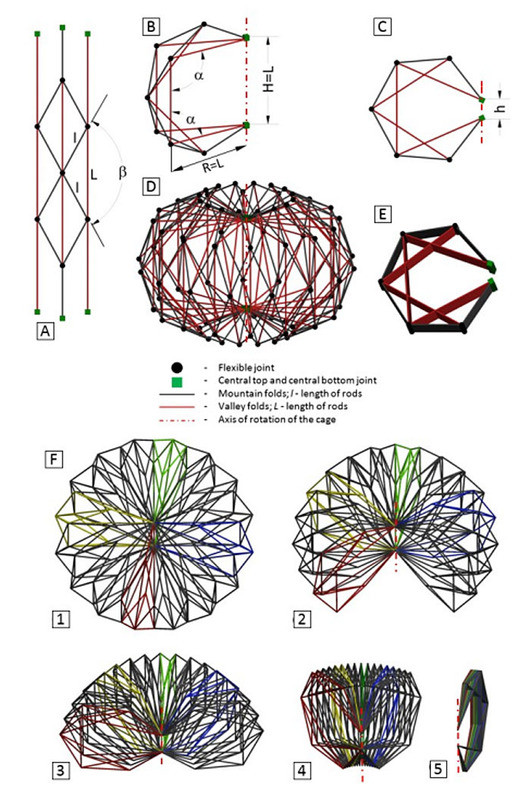 The researchers also plan to explore different shapes for the cage to accommodate different kinds of packages, as well as potentially adding features like parachutes, extra sensors, and cameras, linked to smartphone apps which will aid in remote control and verification of recipient identity. Broadly speaking, this is a clever approach to an issue that’s becoming more critical as drones become more widespread in all kinds of applications. Drones such as these would not only make deliveries safer, they would also be more well-suited for flying into treacherous terrain or disaster zones, thanks to their protective cage and potential ease of use, even for the inexperienced.